If you run a used car dealership, you do not need us to tell you how competitive the industry can be. Every town has a wide array of options to choose from when it comes to buying a used car. In addition to the many dealerships, there is even competition with private sales. How can a business owner stand out from the competition and attract new buyers? 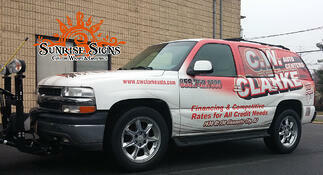 These days, the most cost effective method is with fleet vehicle wraps for auto centers in Gloucester, NJ.